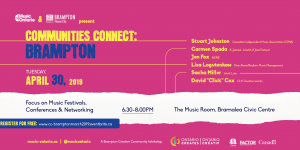 MusicOntario Communities Connect is all about bridging the gaps between Ontario’s vibrant music markets! During our Community Development Research Project (CDRP), we asked musicians, artists and industry professionals across the province what types of support and education they hoped to have access to regionally. 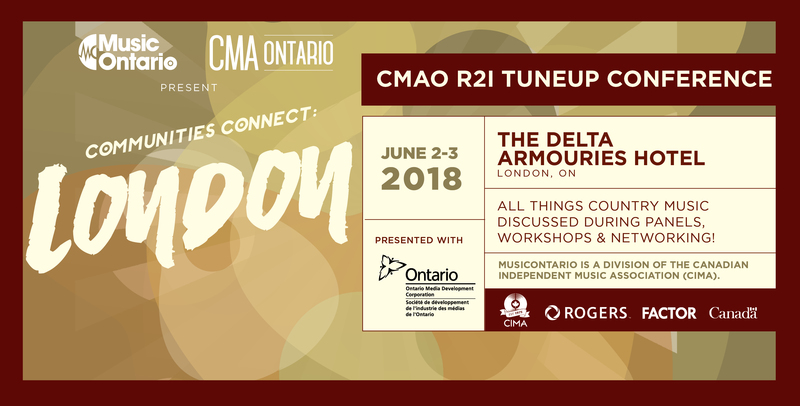 London, ON is hosting the Country Music Association of Ontario Awards in 2018, and we’re going to provide crash courses on how smart artists can survive and thrive in today’s competitive market with emphasis on building a fan base, online merchandising, tours and more! Accelerate your career relationships. Join us for an interactive 90-minute session of roundtable discussions offering unique opportunities for learning and professional exchange. 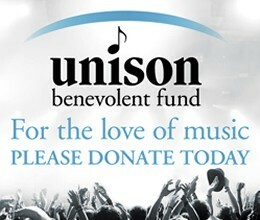 Get direct access to funders, agents, managers, labels, producers, talent buyers and festivals. Come prepared to engage in in-depth discussions, give and receive targeted feedback, meet colleagues with similar interests, and learn from the questions and experiences of your peers. Following the model of a typical “speed dating” session, you will have the opportunity to speak with key presenters and industry participants as you rotate around the room. Michelle Wright, Artist; Patrick Duffy, President, Attention Design Inc. Evolving technological advancements have changed the music industry climate and quickly transformed how people consume music and how artists make it. To own their success, artists now need to be musical entrepreneurs. They need to develop their image and brand and know how to assess their value, raise money, manage their time and projects, cultivate engagement, and market their art – just like a business. Find out what it takes to manage yourself successfully – from the routine administrative tasks to strategic planning - and when “doing-it-with-others” outweighs “do-it-yourself”. Sam Arraj, CPA, Seeds & Co.
Not so long ago, radio ruled the world of music discovery, pushing music to the fan. Now, streaming has become the main means of consumption, with fans driving the process. In a landscape dominated by services such as Spotify, Apple Music, Tidal and Amazon, it is possible to have a hit without radio – or much of the public – even noticing you. The opportunities for discovery are now global. With so many specialist playlists for acts to be added to, new artists are bypassing the gatekeepers and finding themselves generating repeat plays where they had none previously. But has streaming liberated new artists from the constraints of regimented radio playlists only to replace that system with a different set of gatekeepers? What tools are available for artists to move listeners along the fan acquisition pipeline, and when does it turn into revenue? A perennial favourite, the DEMORAMA LISTENING SESSION, provides you with the captive audience you’ve always wanted. Come listen as seasoned music professionals play and review select recordings from the CMAOntario audience, weigh in on song structure, lyric writing, chord progression, and share their initial reactions to your work. Get into their heads and learn what they listen for when hearing new demos and be part of the discussion about what makes a strong first impression and why. This is a chance for artists to meet and discuss their work with fellow songwriters, while getting personal feedback from a distinguished panel from both a craft and business point of view. Your brand is more than just your logo – it is your identity as a band or as an artist. It’s how you first appear to people, how you market your music, how you’re seen and considered. It’s the thing people will recognize in an instant as you, as your look, as your creative output. Now more than ever, visual content is king. This includes not only your live performance, but your online and offline assets as well. (website, promotional photos, social media handles, profiles and communication, logos, video, album design, merchandise, etc.). Hear best practice advice on building a consistent brand through graphic design, imagery, and mission-specific language to elevate your memorability and audience awareness. This weekend 8 emerging artists had the opportunity to participate in a professional photo shoot with the eminent Rob Waymen. Here, the panel will demonstrate the difference a single good photo can make on your entire brand. Patrick Duffy, President, Attention Design Inc. Turning an observation or inspiration into a song can be like striking a match. Sometimes it leaps into flame, sometimes it sparks, fizzles and smokes. Sometimes you can’t find a match. Whether you've been stuck writing the same song over and over, can't seem to finish an idea, or you're just looking for new ways to expand your sound, you'll find practical tools to help you grow as a musician and writer. In this session, we will discuss and demonstrate different ways to approach writing a song, navigating the curse of the second verse, writing alone vs. collaboration, and harnessing your muse. 1:00pm - SOCAN 101: The Ins And Outs Of Rights And Royalties (Luncheon Presentation) - Melissa Cameron Billions of new sound recording releases each month require both rights owners and music services to employ specialized software and systems to register and license works, and to account for and pay out on royalties - all on a global basis and at extremely high speed and volume. SOCAN and its predecessors have been administering the performing rights of Canadian songwriters, composers, lyricists, and music publishers for more than 80 years. That tradition continues today in an organization that is leading the way in the rapidly evolving music industry and is dedicated to upholding the fundamental truths that music has value and music creators and publishers deserve fair compensation for their work. 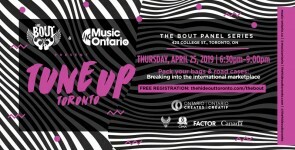 In this lunch and networking session, SOCAN A&R Representative, Melissa Cameron-Passley will cover the basics about SOCAN, royalty administration, rights management, synch placements, registrations and licensing.